I admit it, I'm a little obsessed with chefs. I love reading chef autobiographies and discovering the stories and experiences that led these talented professionals down the path of culinary greatness. My recent favorite is Life on the Line by Grant Achatz, and I highly recommend this awe inspiring story of a genius chef, his rise to fame, and his battle with tongue cancer. I watch plenty of cooking shows (interestingly they are all competition based) and my favorites include Top Chef, Master Chef, The Next Iron Chef... are you starting to pick up on the theme? I've always said that if I ever won big bucks, I would go to culinary school. 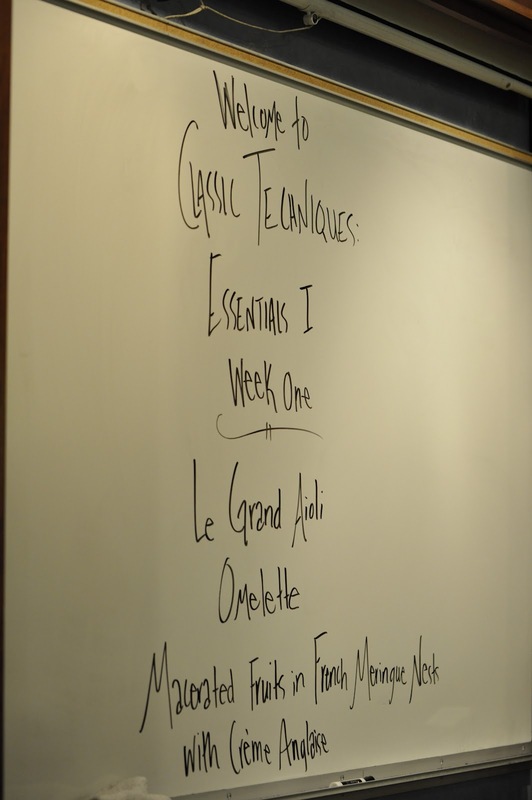 So as a treat to myself (without any winning lottery tickets to speak of), I signed up for a 4 week culinary course at Cook Street, titled "Classic Techniques: Essentials One"
The tagline? Feed Your Senses. Live your Dreams. Yes!! That is exactly what I want to do! I may have my fair share of food knowledge (it comes with my profession), but I don't have all the skills and techniques to apply it and make it successful. I consider myself a "book smart" version of a chef, lots of reading but minimal doing. Don't get me wrong, I love to cook but it feels like I'm making the same re-worked versions of what I already know how to prepare. 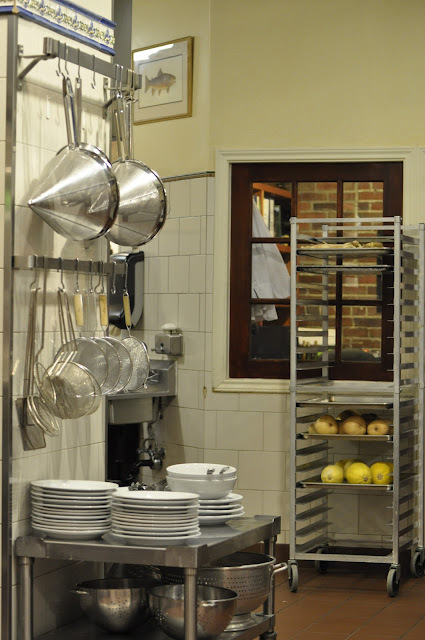 I want to be challenged and stretched into creating new and exciting dishes in my kitchen, not just in my head. The first lesson was all about eggs. I've always heard that the measure of a great chef is how well they can cook an egg. It sounds like one of the simplest things to prepare, but in reality there is plenty to know and understand about the properties of eggs and how they will react under different manipulations. Macerated Fruits in French Meringue Nests with Creme Anglaise. The menus are designed to introduce us to various techniques and methods. Along our egg cooking journey, we learned about the types of salt, making chicken and vegetable stock, and blanching & shocking vegetables. 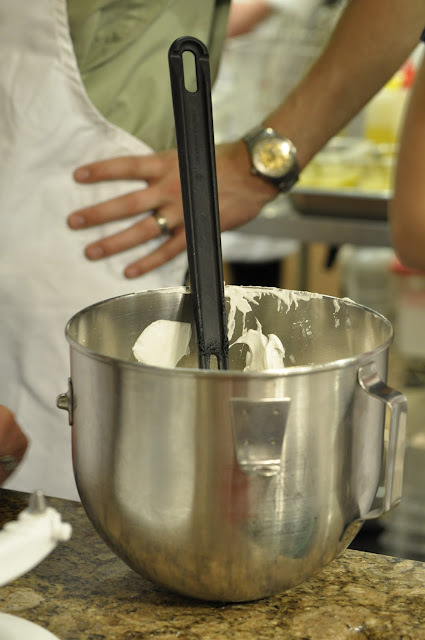 The first item on our prep list was to make meringue for our desserts. 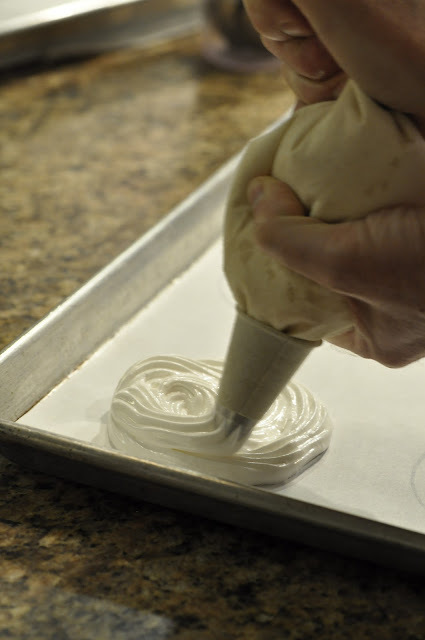 Meringue is simply egg whites whipped with sugar until they hold a shape. We learned that there are 3 kinds of meringue (French, Swiss and Italian) that all use the same ratio of eggs and sugar but are made employing different techniques, some with heat, some without. 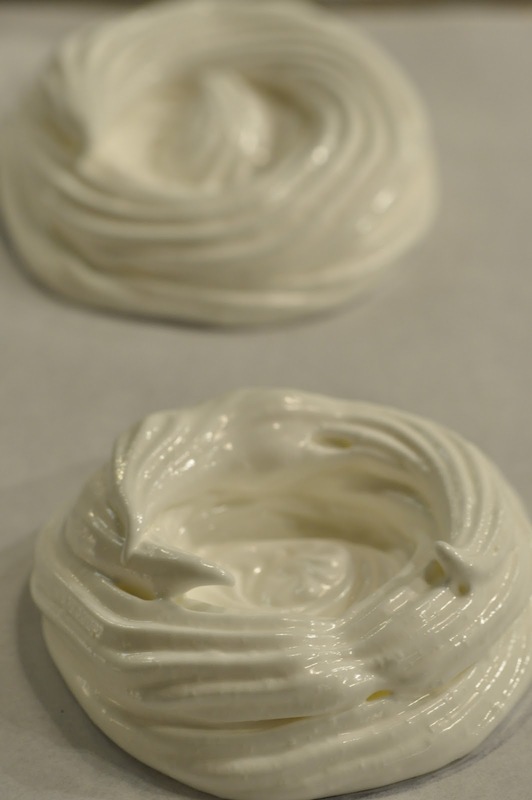 We made French meringue (egg whites beaten with eggs at room temperature), and watched it progress through the various levels of firmness from ribbon stage (the meringue flows like a ribbon) to soft peak (the meringue forms a peak and then falls over) and eventually stopping at medium peak (the peak holds, but is still delicate). We piped them into nest shapes and popped them into a low heat oven (200F) to bake and dry out (about 2 hours). The goal is for the meringue to solidify without turning golden. Cool tip? 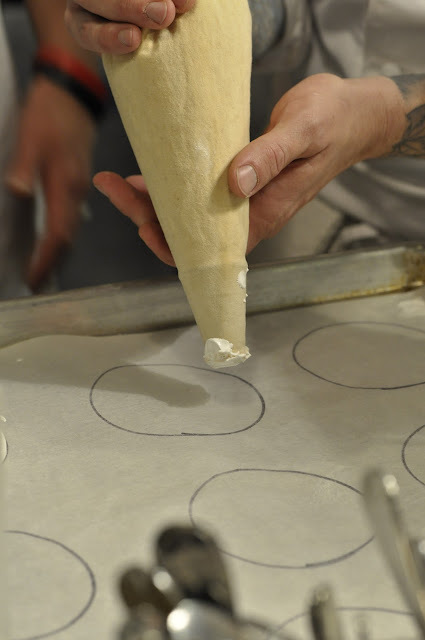 Draw circles on your parchment paper to give you a guide and ensure your nests are all a consistent size. 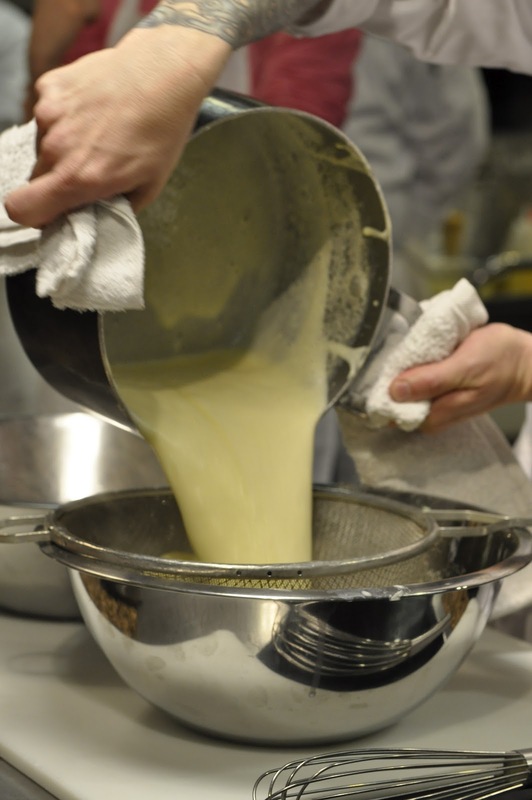 Next up was the creme anglaise. We learned about tempering, which is allows the egg mixture to get used to the hot liquid slowly so that it doesn't seize up and turn into scrambled eggs. We also experienced the difference in flavor before and after the cream was strained. 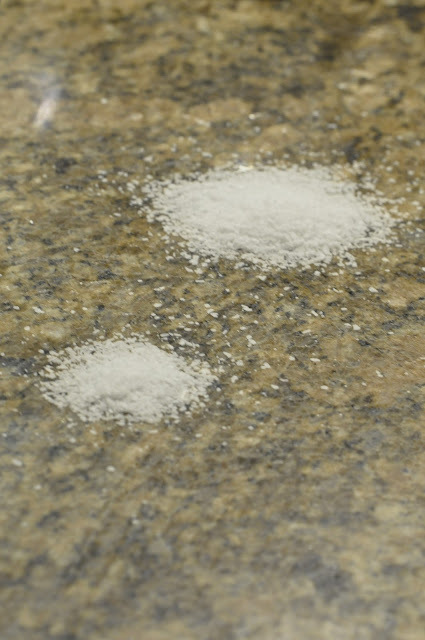 It was shockingly noticeable, and resulted in a creamier, more even taste sensation. 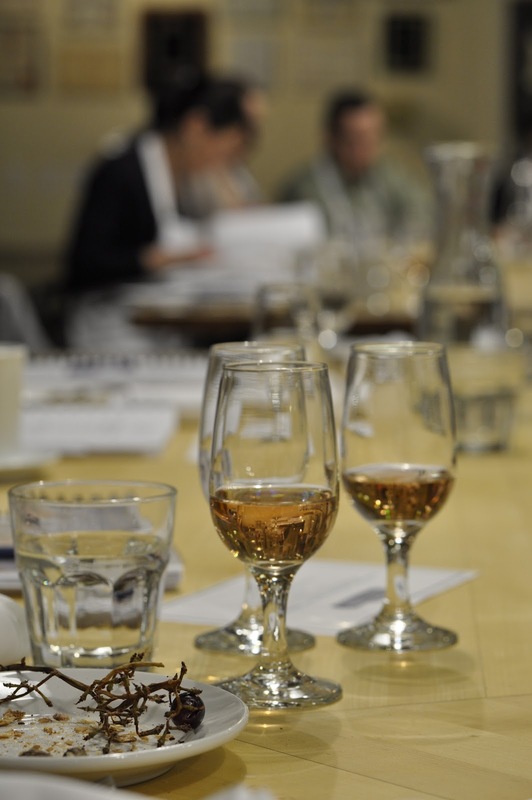 Did I mention that tasting is one of our favorite parts of the class? 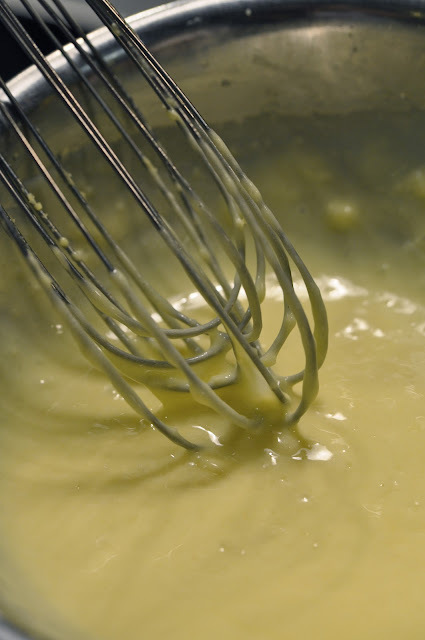 We all got the opportunity to make our own aioli, which is a simple mayonnaise with added garlic. Once you know how to make it, you can alter it with many flavor variations such as tomato sauce, curry and herbs. Aioli is made by mixing egg yolks, salt, lemon juice and garlic until smooth and creamy. We were advised to stir the sauce in one direction and one direction only. This helps to establish the protein bonds and prevent the sauce from "breaking". Note: If you take this class Chef John prefers whisking in a counter-clockwise direction. Clockwise goes against every fiber in his being. 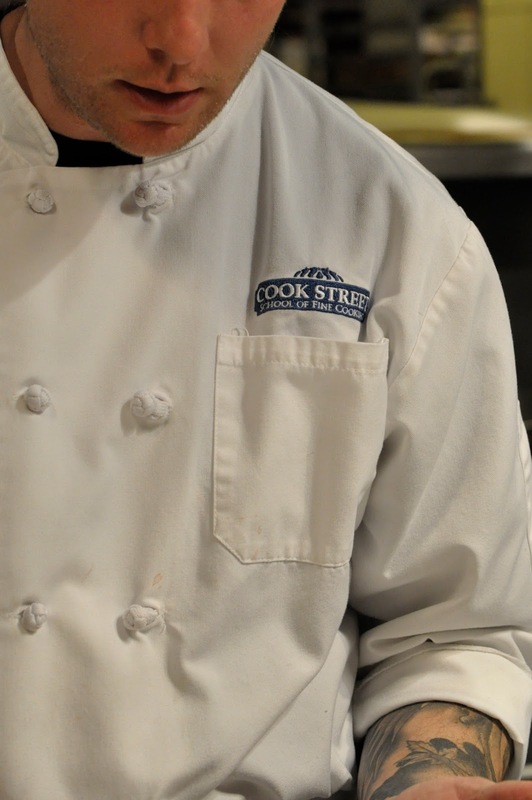 Speaking of Chef John, he is a walking encyclopedia of all things culinary. I'm not sure whether to be amazed or envious (I'm both). I now know how much I don't know. Here he is explaining a bouquet garni, which is a bundle of herbs tied together for flavoring stocks. One of my favorite fun facts of the night was about the measurement of salt. A 3 finger pinch (using your thumb and 2 fingers) equals a teaspoon while a 4 finger pinch is the equivalent to a tablespoon. So cool! We worked as a team to blanch (boil) and shock (cool quickly in ice water) fresh asparagus and broccoli. 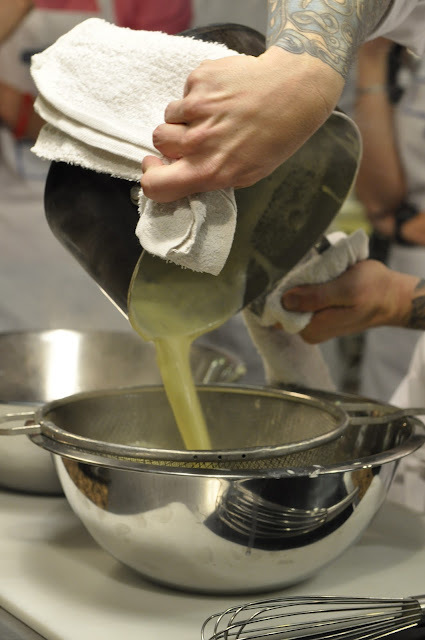 This technique helps to keep the texture and color of the vegetable intact, and allows for a quick re-heat at time of service. Finally, it was time to make the omelettes. We started with room temperature eggs and beat them with water to provide additional air and subsequently result in a fluffier texture. Milk or cream (a common addition by most) will just weigh down the eggs. 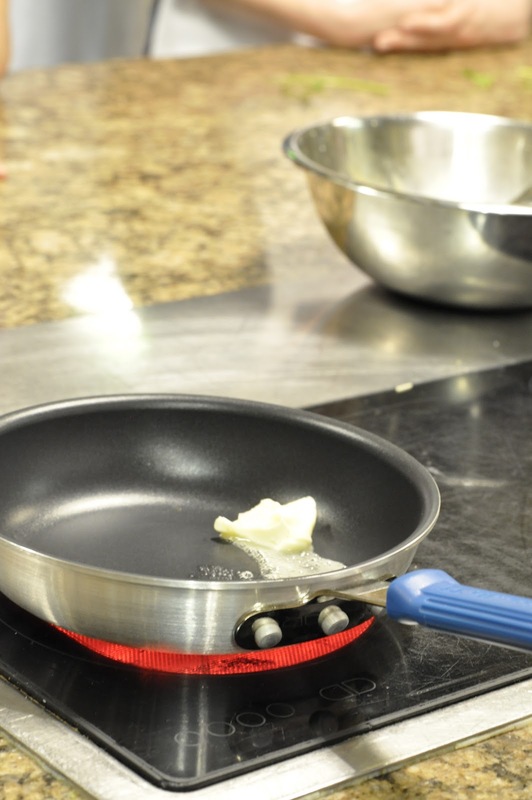 How do you know when your pan is ready? When it is silent. The butter will sizzle until the water content in it is cooked off. Just as it starts turning a little golden, and just as you think you've waited to long it is ready. Contrary to what I have always done, you actually keep the eggs moving in the pan by pulling the edges in and allowing the liquid to fill in the gaps. Hmmm, so much for just letting the eggs cook undisturbed. I also learned that you only cook an omelette on one side. Thats right, no flipping required. Phew! Seeing as my flipping success rate is sadly close to zero, this is one tip I am perfectly eager to embrace. The cheese is supposed to get added while the eggs are still a little wet and then the pan is removed from the heat. You should depend on residual cooking to melt the cheese and finish cooking the omelette. Another hmmm. I normally cook my eggs to completion. And beyond. Yup, my omelette making knowledge was rattled from start to finish. 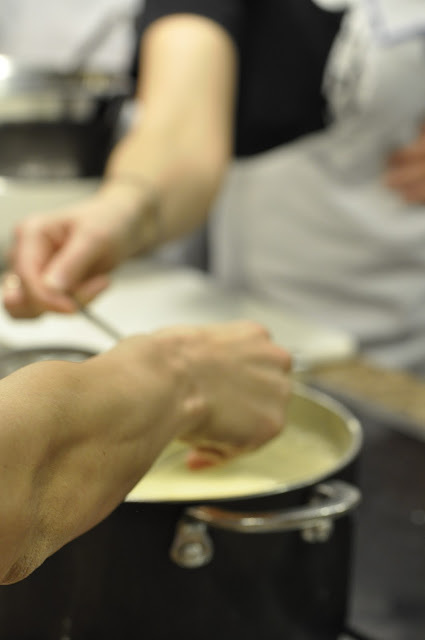 The magic of a beautiful omelette depends on how it comes out of the pan and onto the plate. We learned this really easy rolling technique that is sure to impress anyone. Well, maybe a non-chef anyone. Dinner at last. We ate our gruyere stuffed omelettes with chilled fresh veggies, boiled potatoes & shrimp. The aioli on the side made a perfect dipping sauce and provided some tang and garlic to the plate. I have to admit, it was the best omelette I've eaten in a really long time ever. The meringue nests were plated over our vanilla creme anglaise and then topped with fresh berries. It is hard to say what I enjoyed more. The food? The learning? The experience? I guess it doesn't matter. I get three more weeks to figure it out, and I can't wait. Wow, super write-up! What is the best pan for cooking the eggs/omelettes in? I always used non-stick (but it's been kinda destroyed these days) so i use a regular skillet with a bit of olive oil or butter or cast iron they both stick. I've watched the Jamie Oliver video too (about pulling the sides in). And great pictures! We were advised to use a non-stick pan as they don't get hotter than 300F and therefore your food won't stick. They are perfect for eggs, pancakes, and crepes.. items you don't want to cook at too high of a heat. But for meat and fish, we were told to use a regular skillet which can get much hotter, up to 500F, to allow a good sear on the surface thus locking the juices inside. 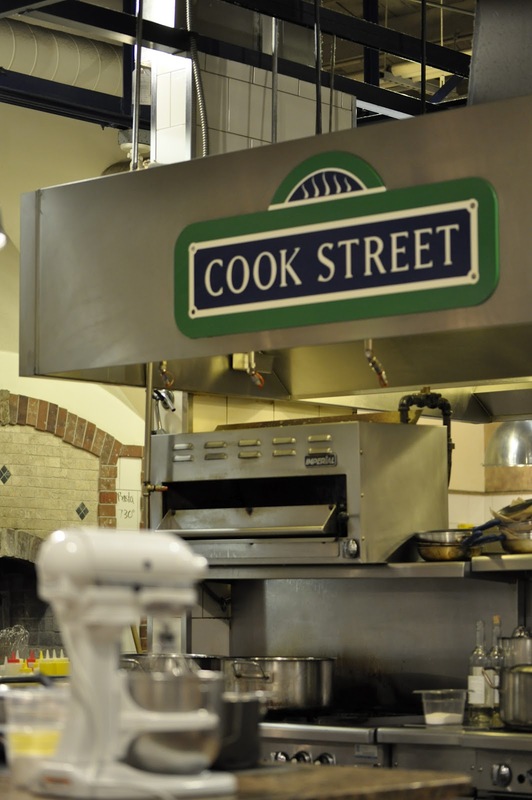 Cooking school has already expanded your repertoire. Those of us lucky enough to read about your culinary exploits can learn from your perceptive prose. The techniques for making meringue shells, aioli, and creme anglaise are revealed in a happy, chatty way. I always thought that omelet making was my forte but I must admit the "silent butter gamut" was a revelation. No more brown butter for me!! Continued success in cooking school. I'll be reading and watching and maybe even cooking.